Villa Oasis - Ibiza Villas 2000 - The best value villas in Ibiza! This villa is an independently owned property. We personally know the owners and the villa and you can securely make your booking through us. However some amenities, payment terms and security deposit arrangements may differ. 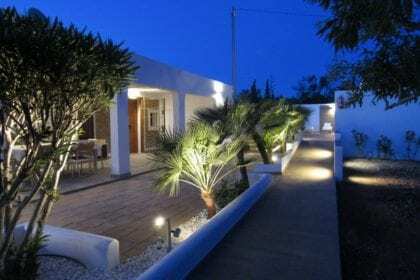 This Ibiza Town / Playa den Bossa villa comfortably sleeps 12 guests. We are delighted to be able to offer this beautiful large villa near Ibiza Town and Playa den Bossa as part of our ad-hoc programme. Villa Oasis is a beautifully appointed six bedroom property in a really convenient location and close to major routes to be able to reach all parts of the island with ease. 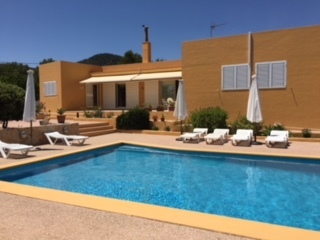 However, Villa Oasis is situated in a 3200m squared plot, so despite being so close to the busy hub of the city and the vibrant resort of Playa den Bossa, the villa is completely peaceful, with countryside outlooks and views of Ibiza Town. The beautiful pool area is spacious and extensively paved giving ample room to relax around the pool. There are various large terraces offering further wonderful countryside and sea views. The house has the added advantage of various social spaces. In addition to the living room there is a further sitting room and a games room. This villa also has its own gymnasium on the lower ground floor for anyone wanting to keep up their workout routine whilst on holiday. If fitness is your thing, then this is definitely the house for you as Villa Oasis also has its own private tennis court. The villa is attractively furnished to a high standard and is a great choice for groups or families looking for a peaceful and spacious property, but want to be near the busy major resorts of the island.